Great news everyone! 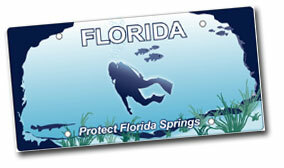 The Protect Florida Springs specialty license plate is now available at most DMV offices throughout the state. I actually got mine a few weeks ago -- the first day they were available. Getting this plate approved was a very long process and a lot of work was done by many people. I greatly appreciate Wildlife Trust and Wildlife Foundation of Florida making this plate a reality. Do your part to protect Florida springs and get one of these plates. The registration fee is only $25 and is distributed to Wildlife Foundation of Florida.